What is the Tawang Festival? 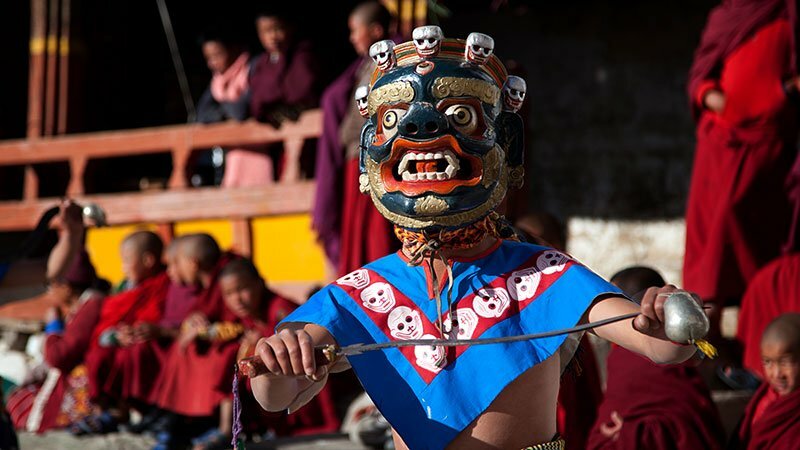 The Tawang Festival is a 3-day festival organized by the State Tourism Department. It was designed to promote tourism and display the culture and traditions of the city as well as the entire state. It might not have become as big and popular as the Hornbill Festival or the Ziro Festival but it still attracts the participation of distinguished personalities from across the world. What happens in the Tawang Festival? Every year, the festival begins with a religious tradition which is Sebang – the religious rally of monks from the Tawang monastery to the festival spot to declare the festival open. This Cultural Festival has everything from revealing Buddhist religious events, tribal and traditional dances, handloom products and other crafts made by the locals, local food delicacies, historical movies of the State, photography, painting exhibitions and more. Tawang is a town situated at an elevation of approximately 3,048 meters (10,000 ft) to the east of Bhutan. It is 326 kms from Tezpur, 447 kms from Itanagar and 488 kms from Guwahati. The second-largest Buddhist monastery (gompa) in the world is here and was built in 1681. Any person who wants to travel through any part of Arunachal Pradesh (in North-East India) requires an ILP (Inner Line Permit). As per the information available on the Arunachal Tourism website (here), ILPs can be obtained from the relevant offices in Delhi, Kolkata, several cities in Assam (Guwahati, Tezpur, Jorhat, North Lakhimpur etc) and from Shillong (Meghalaya). You will be given a token number. Go back at the time that you are asked to come and submit the token to collect your ILP. All foreign tourists require a Protected Area Permit (PAP) for entering into Arunachal Pradesh. The permits can be obtained All Indian Missions abroad, All Foreigners Regional Registration Officers (FRRO) at Delhi, Mumbai, Kolkata, Chief Immigration Officer, Chennai, Home Ministry, Govt. of India and Home Commissioner, Govt. of Arunachal Pradesh, Itanagar. The permit requirements were relaxed for foreign tourists in 2008, and now generally only two or more people need to travel together to obtain the permit. However, single travelers can also obtain PAPs but their visit will be restricted to areas like Tawang, Bomdila, and Ziro. Permits are available for a duration of 30 days (cannot be extended) for a cost of $50 per person. The form is available online and has to be filled and duly submitted at any of the Foreigners Regional Registration Office (FRRO). From Guwahati in Assam, one can take a bus to Tezpur or Bhalukp, ng and then take a bus to Bomdila, run by Arunachal Pradesh State Road Transport Corporation (APSRTC) to Bomdila, stay overnight there and take a bus to Tawang the next morning, as it is not safe to travel in the mountainous terrains after dark. One can also take a direct bus from Guwahati to Bomdila and reach there in 11 hours and leave for Tawang the next morning. From Tezpur (Assam) and Bomdila, you can easily get buses, taxis, and shared taxis to reach Tawang. Arunachal Pradesh does not have its own operating airport. The nearest airport is Salonibari Airport in Tezpur located at a distance of 317 km from Tawang. Air India Regional flights operate to/from Kolkata and Silchar. However, the airport in Guwahati is more feasible to travel to Tawang. Lokapriya Gopinath Bordoloi International Airport in Guwahati is located 480 km from Tawang and is connected to all the major cities in India. Naharlagun Railway station and Guwahati railway station are the closest railway stations to reach Tawang. Since it’s now a major tourist attraction in the North East, Tawang has quite a few accommodation offerings. However, do not expect 3-5 star accommodation in this hilly region! The accommodation range from simple budget hotels, to guesthouses, homestays, and hotels. You can book your stay through travel agents or through sites like Cleartrip and MakeMyTrip. Tibetan delicacies like thukpa, momos or simple and delicious paratha-sabzi eaten hot from the roadside shacks on cold misty days are a treat! Most restaurants in Tawang serve these. A small shack called Annapurna serves delicious potato chips. The traditional Monpa cuisine uses a generous amount of chilies and fermented cheese, which has a strong flavor and is not for the faint-hearted. Some of the best food is found at the small, nondescript, sometimes not very hygienic, eateries, that serve authentic dishes at very affordable prices. They are sure to be an authentic food of the region as they are mostly frequented by locals. Suggested Read - The best things to do while in Kalimpong! The famous momo, widely eaten in the northeast and other Himalayan regions, is made by stuffing minced pork and onions into a dough and then steamed in a three-layer steamer or fried. The thukpa is a soup filled with noodles, minced meat, and vegetables, also known as der thuk. Ashum thukpa is made of maize, beans, and meat. Zan is the staple dish of the Monpa tribes. It is usually made of millet flour. It is usually had with vegetables or meat to which is added fermented cheese, soya bean or other herbs. Khura is a pancake, had with tea. Gyapa khazi is a kind of pulao made of rice, fermented cheese, small dried fish or shrimp, chilies ginger and other spices.